So for this weeks topic we are talking all things autumnal fashion. 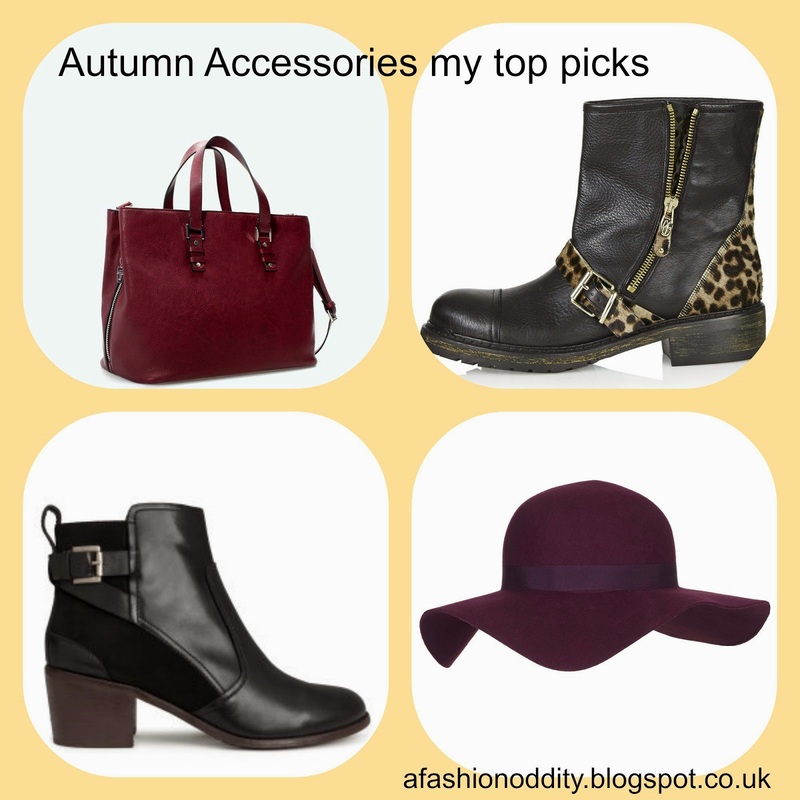 So I have got my top autumn jackets, tops and accessories for you today this is also a bit of a wish list for myself. So its that awkward time when it starts to get colder but its not quite time to get our winter coats out. A leather jacket is a must they are so versatile and go with everything then these two beauties caught my eye both are so pretty and would be the stand out piece of an outfit. The ridging and autumnal colours are so on trend and everyone knows how much I love Brocade. 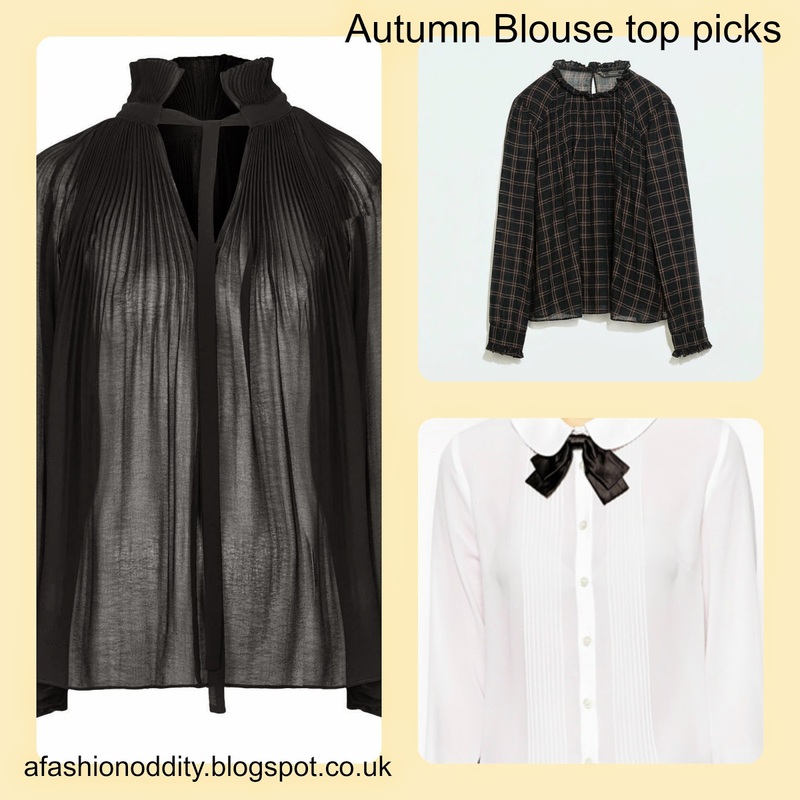 Blouses are so big this season especially the Victorian style this high neck blouse from topshop is great and would go so well with patterned trousers I think and the bow blouse is just screams Victorian inspired. I love check shirts and they are always so popular for autumn but this amazing blouse from Zara is a great more formal alternative. Finally we have accessories. Ankle boots are everywhere this season and I love these two as they still show some personality without being OTT. I love the touch of animal print on the CJG ones. The next thing we need in our wardrobe for Autumn is lots of berry colours and this bag and hat are perfect especially to brighten up a very dark or minimalistic outfit. I hope you have enjoyed this post! Let me know in the comments your favourite item that I wrote about and link you #teenblogseries post. So we are well and truly into Autumn now so no matter how much we may be wanting Summer to come back I am sure like me you are all dying to get a new wardrobe for Autumn and plan out all those new outfits. So I am starting with Jewellery and all the trends. ﻿Normally Gold is massive for A/W but from the A/W14 fashion weeks silver was everywhere especially on large statement pieces. Another big trend is different textured jewellery such as medallions seen at Versace and oversized chandelier earrings at Marchesa. Shapes were also seen everywhere from big rings with circular shaped gems to square shaped bangles. Finally there is a lot of birds dainty little chains with birds on the end and feather necklaces. These are my top picks for the season. 1.Leaf ring - As the season changes into Autumn we will see the leave change colour then we will get to walk through piles of crunchy brown leaves and this beautiful gold ring is a beautiful way to inject some of that into your wardrobe. 2. Eden Jardin gold earrings - As we saw at Marchesa big chunky earrings are everywhere and the autumnal colours here just jumped out at me. 3. Leaf necklace - This necklace just screams Autumn and it is so versatile. It would go nicely over a little black dress or with jeans and big jumper. It is also two toned so this is a very rare item that makes both silver and gold work well together. 5. Lapis Lazuli Silver ring - As I said above shapes are everywhere and so this massive square ring is perfect for autumn. 6. Topaz bracelet - Ever year the trends change but some things are always perfect for Autumn like the mustard shade of yellow. Whether is a big chunky mustard knit or this little mustard bracelet make sure its somewhere in your wardrobe. 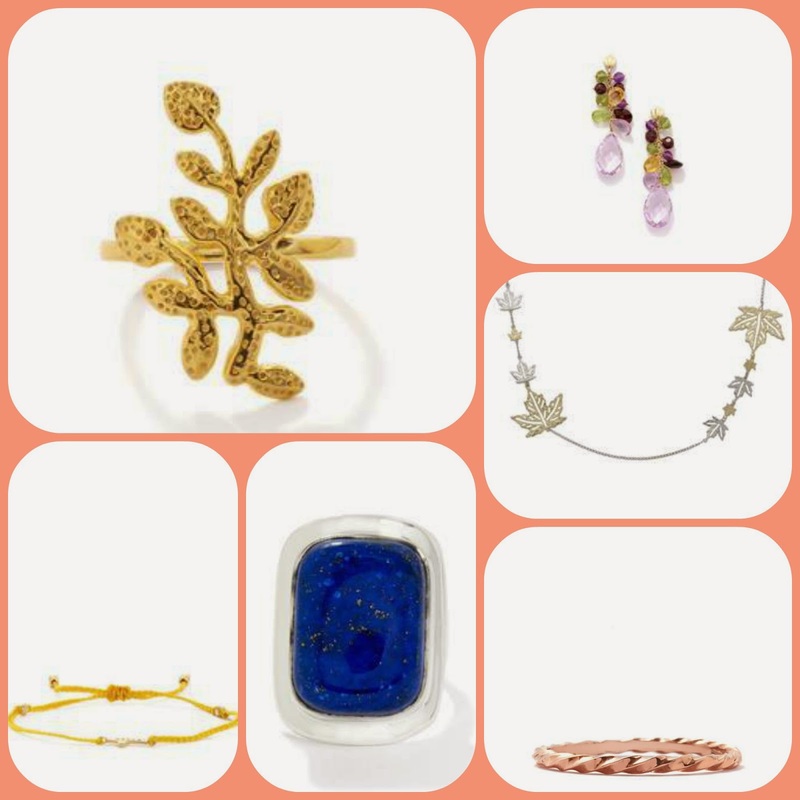 I hope you have enjoyed this post and let me know in the comments what your jewellery must haves are for Autumn. Today we are talking about something I never thought I would be on this blog and something that many of you will think of as TMI and that's underwear. None of us really have a clue which bra type does what right? Well the guys over at Aerie have created this simple explanation to make it just a little bit easier for all lost ladies. So this is the graphic for the campaign which I found so interesting. I already knew about a push up, a bare bra and all the different uses but I had never seen a easy to use and detail diagram like this before. The tip I found most eye opening is that there is a special bra specifically for layering and its okay for it to be seen under a top. I think it is exciting that Aerie are creating this information as it is good to understand what the bra your purchasing actually does and its surprising how little its talked about. This helps woman choose the right bra for them as there are so many slight differences between the bras such as the full coverage and the demi coverage before I would've thought they do the same thing but now I know one is more suited to a smaller bust than the other therefore the demi would be the better choice for me. Content like this is so useful for example I never knew that I really should be wearing sports bra just for a few squats and sit ups which is the extent of my workout routine. I am sure you can agree there has been so many occasions when I have been dragged to the prettiest bras on offer but actual fact they don't give me the support I need or anything. 80% of women are not wearing the a correctly fitting bra and 27% of women didn't buy a piece of clothing as they didn't have the right bra to wear underneath. Well this is no longer a problem! Here is the Aerie blog post for more information. I hope you found this post interesting and let me know in the comments your top bra shopping tips or if you learnt something new here. Thanks for reading! So on Saturday we headed into Bristol in the evening to celebrate my cousins 18th birthday with a meal at the restaurant in Harvey Nichols. I had never even been in a Harvey Nichols before or a Selfridges for that matter the poshest I have gone is House of Fraser (or John Lewis no one knows which is the high up between those too). I was so excited. Me and my mum agreed we had to get there early to have a brief look around the store. I was amazed All these brands I had only ever read about on blogs like By Terry and Charlotte Tilbury were all there in front of me. As we went up to the clothes well I could've been in heaven. So many designers on the rails that I just wanted to buy everything (when in reality we were too scared to even touch anything). So obviously going to a what I call 'Master chef' style restaurant deserved a winner of an outfit. Just how pretty is this butterfly print skirt? Teamed with some great heals, the beautiful necklace and the sequin shoulder detailing walking round Bristol I felt like a star I'm not gonna lie. Also I am so in love with this clutch from DP (my first proper clutch shushhh) I love the touch of metallic. My yummy Tiger prawn and noodle starter. Brixham plaice with a mushroom and garlic compote and sapphire for mains. I had a great night wining and dining like a star with my family. So from Saturday (20th September- 27th) in Wales its Support your high street week. The government have been running this campaign for awhile now to help save our local businesses. For anyone who knows me you'll know how much I love shopping in unique independent shops. I also run the #welshbloggers weekly twitter chat (follow @welshbloggers_ ) and one of my aims with this chat is to connect welsh bloggers with local welsh businesses. I know this post may only apply to my Welsh readers but the message applies to all. The shopping experience is always much more fulfilling when you get a friendly chat with the owner and you know you are helping someone's business. Whether its getting your fruit from the green grocer instead of Tescos or going into your local independent coffee shop instead of Costa coffee it really does help. My only struggle with sticking to local businesses is the price difference and how in every shop from Tesco to boots I have loyalty cards where I am building up points to get money back or the fact I'm not a big lover of hot drinks so I know I can have a iced caramel frappe or something in Costa when in other places the only option is a can of coke. In my town we have some independent coffee shops that I have never tried so I am making a pledge to myself for #supporthighstreets that next time I am going out for a coffee with friends we go to some where other than Costa. I always find shopping local much easier to do when I am away for example if you read my holiday posts form my trip to Salcombe ( read it here) you will see just how many unusual quirky shops I spent ages falling in love with. Salcombe is a very small town with just the one street of shops however there is not one chain restaurant or coffee shop in sight. I got a pasty from the Salcombe deli and we stopped in a cute little café with a great view of the harbour where I had some Lushcombe juice which is from a company local to Salcombe. There was about 5 chain shops (JAck Wills, Joules, J.Crew, Cath Kidson and Seasalt I think so no new look or River Island) and it felt very refreshing. You can see more about the campaign here and if you would like to get involved you can show your support here they are just a few away from the target. Let me know in the comments if you shop in any local businesses to you. I hope you enjoyed this post and get involved! 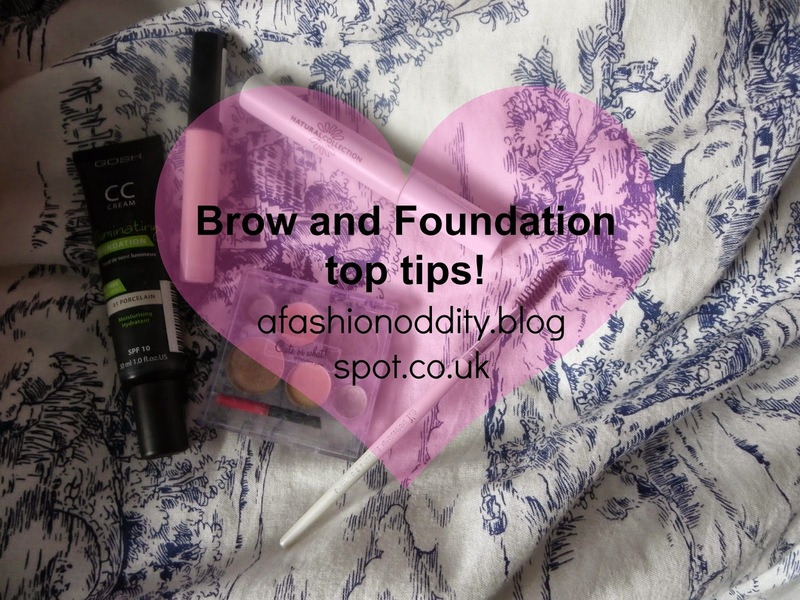 So a couple of weeks I ago I hit 200 followers on bloglovin which is insanely amazing I am so grateful for every single on of you so here is the giveaway to celebrate and thank one of you. It has taken me so long to get this up but now I think its quite fitting being my 100th post too. I love all of these products especially the eye liner it is honestly my number one felt tip liner that I have tried so far. It is so easy to apply without any gimmicks and lasts ages. I just have a few rules. 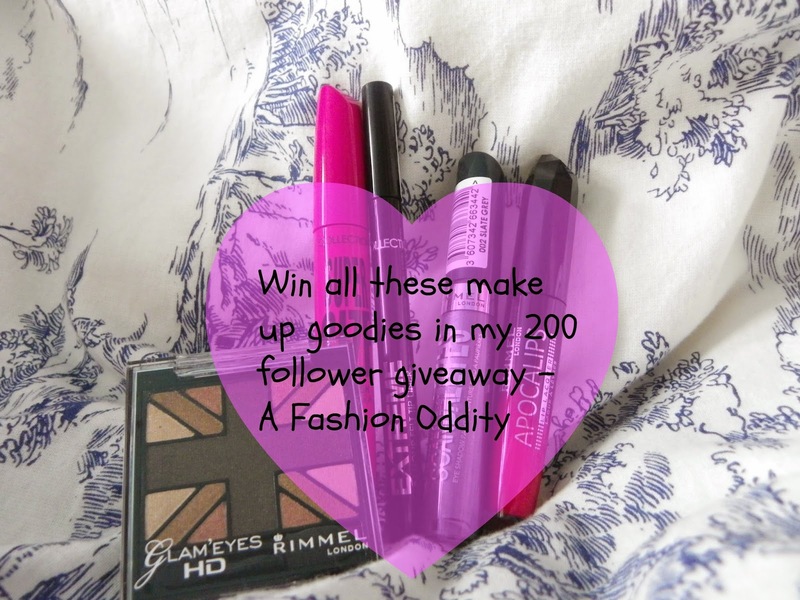 I am afraid it is not an international giveaway so that's UK RESIDENTS ONLY! So thank you once again to everyone who reads my blog. So this weeks topic for the teen bog series is a healthy recipe or tips. I wasn't really sure what to do for this and as my laptop has been sent off for repair I have been a bit stuck so this post isn't as great as I would've liked. Now for my first point I am not sure if this is healthier but its tastier and I wanted to share it with you all any way. When doing out food shop recently in Sainsbury's we spotted these pans with handles to BBQ pizza reduced to only 70p so of course we had to get some. So using our new BBQ we grilled some pizzas instead and wow they taste amazing! The base has a crisp taste to it which is almost as if they were cooked in an Italian stove burner. it really is worth BBQing your pizzas. Next for something not so original but amazing and healthy. As a kid yogurt meant things like Cadbury chocolate ones or those amazing Rolo yogurt pots. I had always liked Greek yogurt but it had never been that exciting until I tried the Yeo Valley Greek yogurt with honey. (I also love Yeo Valley as their HQ and farms are in the same Somerset village where my grandparents live) (sorry I don't have a picture) This is a great way of having Greek yogurt but it still being a sweet desert style too. Just add as much or as little fruit and it becomes a really filling snack. As a massive foodie and junk food lover I love finding easy ways to still eat sweet foods but just slightly healthier. I hope you have enjoyed this post and of course link your #teenblogseries posts or tell me about any recipes I could try that are sweet but healthier in the comments. So for this weeks Teen Blog Series we are talking all things high street fashion. I honestly never do online browsing unless its coming up to Christmas or my birthday and I haven't been into Cardiff shopping in a few weeks so there really isn't anything specific I am lusting over. 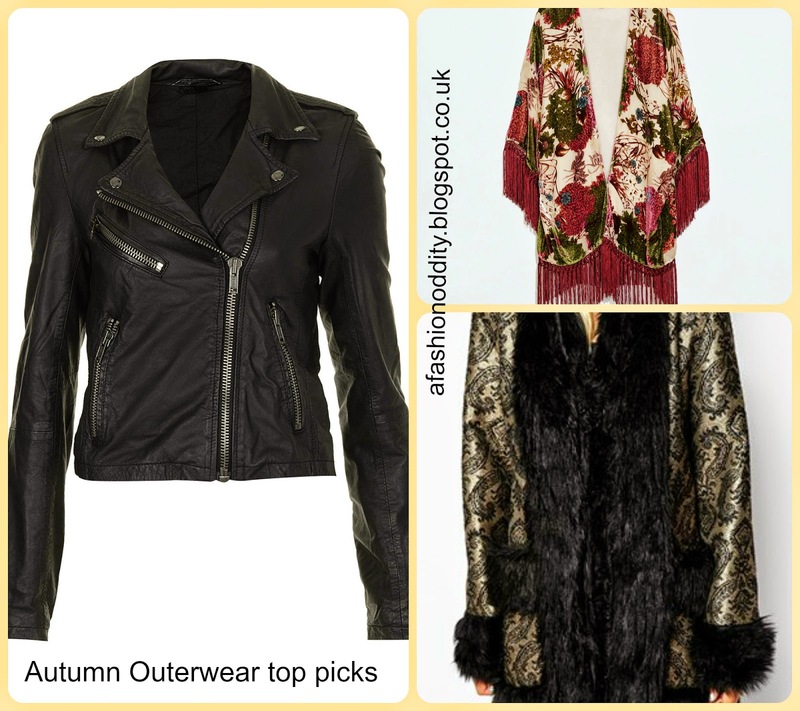 As I was stumped for what to do for this post (most people have done wishlist style posts) I thought I would shoot two birds with one stone and share with you all my top picks for summer into autumn from the high-street in this look book video! I have been wanting to do this for ages then on Tuesday I finally got the chance to film it. 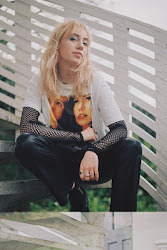 This is a lookbook featuring out fits that are perfect for the warm September days but still have a hint of Autumnal style abut them. I hope you enjoy it and maybe even subscribe to my channel whilst you're over there. So just a quick post today. All through the summer I had been looking for a chocker. I originally saw one in Topshop in about June for £5 and I didn't get it as I felt that was very overpriced. Every time I went back in the store I couldn't find their basic £5 tattoo chocker anywhere they had sets with a necklace too for £10 but I couldn't find the original one anywhere. Every shop I was in over the summer like Primark, Miss Selfridge and New Look I would ask if the had any chocker's in stock and no one did. Yesterday I was in my local New Look just having a browse and I spotted a few months on they had finally caught up with the trend with this bad boy for only £1.99!! I am now so glad I didn't pay a fiver in Topshop especially as I don't think it suits me very much and it is a trend that will pass very quickly I'm sure. I hope you have enjoyed this post and I hope to do more of these short bargain or money saving related in the future. Thanks! So today was my first day of year 13 in college, so my last year before university or work. The topic this time for the #2014bloggerchallenge is new begins and that's exactly what September is for me. I am not one for resolutions at New Years however I always feel the need in September. I come back after a long refreshing break and I reflect on last year and its important to learn from the mistakes I made I last year whatever they may be. I already know just how hard I am going to have to work this year. I didn't do half as well as I could've with last years exams and I'm now picking up Photography AS ( so we will see this time next year if my blog photography has improved haha) instead of carrying on with art which means I wont even get 4 full A Levels at the end so if I do decide to go to university I will need to work extremely hard this year. - I have started this yeah with a big stationary shop. - This year I am going to try and write summary notes when I get home each evening making sure I understood everything in the lesson and to help it stick in. This should also be a good start to revision notes. This will be so useful just really tricky to stick to. when I come home from a stressful day I will go straight to YouTube or something and not writing out notes that isn't even homework. I just need to find the motivation and focus in me to do my best this year, the only problem is that even after one day back I feel so tired and drained I don't know what I will be like in six months after all the homework and university applications just as revision and exams come along. So wish me luck for this year and good luck yourself for what ever this new term means for you whether that be GCSEs, A levels , uni or a job. We will talk and help each other out in the comments!